“I realized that I had this huge responsibility to supervise agriculture internships, but I had no formal occupational safety training,” said Megan Roberts, Assistant Extension Professor for the University of Minnesota. Unfortunately, this is not just the case for Megan but for many people who assume the role of teacher in agriculture. This concern was Megan’s inspiration to lead the UMASH-funded pilot project Occupational Safety and Health Curriculum Development and Training for Minnesota Agricultural Educators. Megan served as Principal Investigator on this pilot project in her former role of Agribusiness Instructor at South Central College. 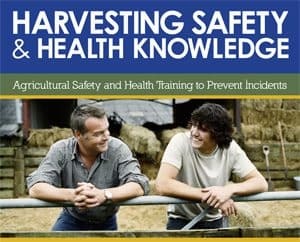 Megan developed a curriculum for agriculture educators that focused on occupational health and safety. 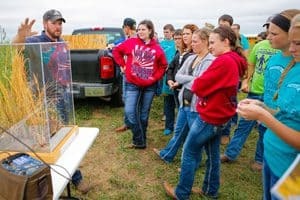 The focal points of the curriculum included tractor, livestock, and grain bin safety. In January and July of 2015, this research was put to action in two workshops. Attendees of the workshops included farm business management instructors, high school agriculture workplace supervisors, and agriculture internship coordinators. In other words, the ag-teachers became the ag-students. According to Megan, creating the curriculum was about finding the most reliable resources and making them relevant to agriculture. “I didn’t create anything new,” said Megan, “but I compiled resources from the Safety in Agriculture for Youth (SAY) National Clearinghouse, the Occupational Safety and Health Administration (OSHA), and the Department of Labor’s regulation guidelines to fit the safety needs of agriculture students.” Megan also worked with agriculture instructors who work closely with people on farms. I wanted to make sure the curriculum met the needs of those who are in the field day after day. The biggest challenge for the project was low attendance at the workshops. “Safety seems to be a priority for people, but actually taking time out of their schedules isn’t,” said Megan. Although the number of workshop participants were low, the project produced a significant output. The entire curriculum can be found on jump drives that are free for any agricultural educator to use. Megan is eager to share it with as many ag educators as possible. “I want to be sure it doesn’t just sit on a shelf but gets used in various ways,” said Megan. Megan is also continuing her research in agriculture health and safety in her doctoral dissertation. She believes that her new connections will help in the future. “I was able to network and make great connections with UMASH which should help me do good, high-quality research down the road,” says Megan. This project was funded by the Upper Midwest Agricultural Safety and Health (UMASH) Center’s pilot project program.